Full step-by-step color instructions for a super cute Mushroom Spool Pincushion which makes a magical home for your sewing pins. An easy toadstool project to sew and a cute gift. Here's a magical home for your straight headed sewing pins with a novel fabric mushroom or toadstool spool pincushion or pin keep that you can make. It's an easy project (once you know how it's put together) and is useful for re-purposing old thread spools and scraps of fabric too. Have loads of fun making this cute mini mushroom project which is sure to get loads of comments from family and friends. If you love sewing unique little projects, check out the pincushions for every occasion book at Amazon. Updated tutorial to make a mushroom spool pincushion here. 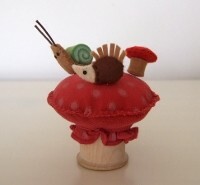 This toadstool or mushroom spool pincushion is a cute make and so great for quick crafty gifts too. It's quick and easy because the spool makes up the base of the mushroom already for you which means you only have the top part to sew. You can use any spare scrap of fabric that you like, perhaps left over from another project or from some old clothes. The mini pins are all handmade - these aren't included in today's tutorial but I might include larger versions in a tutorial at a later date. Do enjoy this and have fun with the project. 1) An empty sewing thread spool to form the base of your mushroom or toadstool. Wooden ones look particularly gorgeous but plastic ones can be covered over with a pretty paper print as shown in the image here where I've covered some with scrapbook papers. 2) Some small, pretty fabric offcuts. Red is a great choice for a mushroom or toadstool top but browns would also work well. 3) Sewing thread, needle and scissors. The basics! 4) Plush toy stuffing. You can buy this in bags from most craft stores. I have also used plain old cotton wool but that's no good should your pincushion ever get wet. The first step is just to roughly cover the top of your sewing or thread spool. You need a rectangle of fabric which is long enough to wrap around the top of the spool and then to drape over and cover the top. I got lucky with my fabric and found a sleeve off-cut with a pretty, gathered hem that was ideal. You could sew some pretty lace to the bottom of the fabric to get a similar effect. Pull the fabric tightly around the spool and stitch it together to hold it in place. Gather the material overhanging the top of the spool, pull it tight over the top and roughly sew it together. This top section will be covered over later. Find a circle of fabric to form the base of your mushroom cap. I draw around a mug onto the material with a fabric pen. The fabric needs to be around 2 inches wider than your spool when the spool is placed in the middle. Once you've cut your circle of fabric, pop your thread spool in the center and draw around it. Using a sharp pair of scissors, cut just inside the circle you just made in the center of your fabric. Don't cut right to the edges because you're going to push the bottom of your spool through this hole - if you make it too large, you won't get a tight or a nice neat fit. Turn your spool upside down so the uncovered side is showing. Push this end through the hole in the fabric you've just cut. Slowly pull the fabric down to meet the fabric covering at the other end of the spool. If you have a pretty gather or lace, make sure that's pulled through. You now need to sew what is going to form the base of your mushroom cap onto the fabric covering the top of the spool. This can be as rough or neat as you like. This shows what your pincushion should look like now - it is upside down remember! The bottom part of your toadstool cap is now stitched onto the spool and you can turn it over so it's facing up the right way. Cut another circle of fabric to the same size as the first. This piece is going to go on the top of your pincushion and will form the top. Place this circle of fabric on top of the other one and line them up. Stitch this circle onto the bottom one - but don't stitch all the way around as you need to leave a hole to push your stuffing in. I use blanket stitch to sew the raw edges of the two pieces of fabric together but you can use whatever stitch you like. It looks like the spool is missing in the photo but it's just hidden under all the fabric! Pack the stuffing tightly into the gap not yet sewn up on your toadstool cap. Push it right to the other end then sew up a bit more of the edging. Push in some more stuffing, then sew a little more. You need more stuffing than you think to pack it all tightly. Repeat this process until the top is nice and firm, then finish off your stitching so it's all sewn up. What do you think of this Sewing Project? Thank you 2uesday. It would make a super sweet sewing kit gift - I can imagine a pretty toadstool needlebook to match. Thank you @bhthanks, that's very kind of you :) As long as some people like my tutorials then I'll carry on making them. The Mushroom Spool Pincushion is so cute and definitely useful for sewing pins. You have very original, beautiful and useful articles. Thank you very much, Jimmie. Pin away as much as you like. I've found that if I really don't want photos to be shared then I don't ever put them on the Internet! Sharing items when done properly with a link back to the original source is good. A folded flower rosette is so easy to make and makes a stylish centerpiece for a handmade card or a special wrapped gift. Turn into pretty ornaments too, free template provided. Easy Origami Snail Instructions and step by step photo tutorial to make super simple, flat paper snails which are very cute. Paper folded snails just perfect for handmade cards.